Surgery today has come a long way since the early days, for a number of orthopedic implants help the patient get back fit and on his feet again in no time. Trauma implants is usually used in case of an accident which deeply damages the bones. A number of trauma plates or bone plates are used in treatment while the surgery is being performed on a damaged body part. Depending on severity of the accident, shape and size of the body part, these trauma plates or bone plates are placed and fixed which then heal with time and act as a part of our body. These bone implants have become pretty sophisticated today, what with a manufacturer producing hi-tech trauma implants that last and endure. These bone implants go a long way and with new age technology are becoming better and better. Semi tubular plate, dynamic compression plate, hook plate, semi tub and pelvic reconstruction plate are examples of trauma plates that may be used for a variety of injuries to different body parts. Bone implants are done after exclusive analysis of the damaged area using various tests. Depending on seriousness of the injury, bone implants are used to replace the part that is damaged beyond repair. Bone trauma implants or orthopedic implants and instruments are produced today by leading and branded manufacturers like us, Orthopedic-Implants.Net a division of D4 Surgicals of India who are manufacturer, supplier and exporter ensuring the best quality bone implants is at the surgeon doctor’s disposal. They are among a few exporters who have a reputation of manufacturing the best quality bone implants instruments, blades, screws and other surgical materials. These orthopedic implants can also be 100% traced with a computerized record having everything from their manufactured date to details of the end of a surgical procedure in which they were used. To put it down simply, a manufacturer or an exporter cannot fool around when it comes to the quality of these surgical equipments. Basic Instrument set for Plates and Screws, DHS Plate Set, Angle Blade Plate Set, Cannulated Cancellous Set - 4.0 mm / 7.0 mm are used in these bone implants surgeries which can be performed on a number of our body parts with almost no chances of any ill effect. We are leading manufacturer and supplier of trauma / bone implants like bone screw, trauma plates, Intramedullary nail fixator and orthopedic devices. 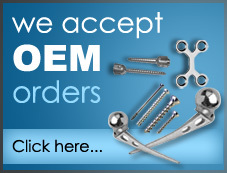 We also export varieties of orthopedic implants, devices and instruments set across the world.